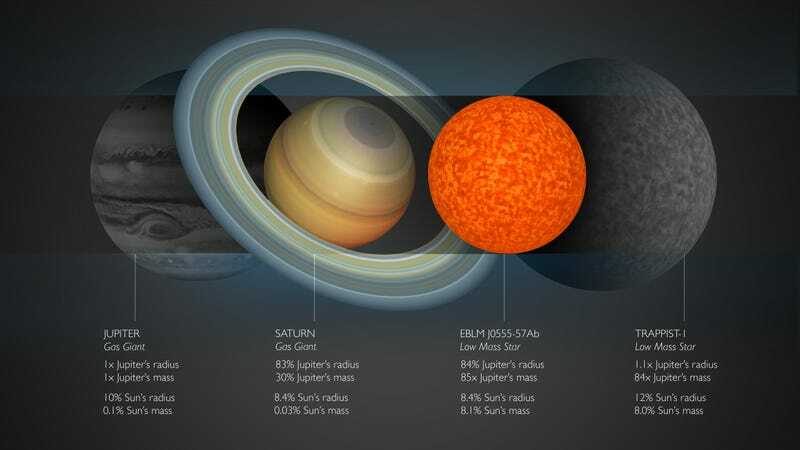 The title of this new Astronomy & Physics study pretty much says it all: “A Saturn-size low-mass star at the hydrogen-burning limit.” This tiny star, called EBLM J0555-57Ab, is about as small as stars can get according to physics, but it’s also one of the densest active stellar objects ever discovered. The gravitational pull at the surface of this object is about 300 times stronger than what we experience here on Earth—which means it has just enough mass to trigger the fusion of hydrogen nuclei into helium. That’s the same fusion reaction that powers our own sun. Indeed, brown dwarfs may be hot and big, but they lack enough mass to sustain stable hydrogen fusion at their cores, which is why they’re sometimes referred to as “failed stars.” But this newly discovered star, dubbed EBLM J0555-57Ab, was massive enough to get a passing grade, meeting the standards for a full-fledged star. Albeit a very tiny one. Prior to the new discovery, the smallest star recorded by scientists was OGLE-TR-122b, a red dwarf star that’s 20 percent bigger than the largest planet in our Solar System, Jupiter. The smallest theoretic mass for a star is around 0.07 to 0.08 solar masses. At 0.081 solar masses, EBLM J0555-57Ab is just slightly above this limit, so it’s possible that even smaller stars are still waiting to be discovered. EBLM J0555-57Ab is located about 600 light-years from Earth, and it’s part of a unique—and rather lopsided—binary system. The tiny star was detected as it passed in front of its much larger companion, which it does every 7.8 days. This detection technique, known as the transit method, is normally used to spot exoplanets. The researchers identified and measured EBLM J0555-57A using WASP, a planet-hunting initiative run by the Universities of Keele, Warwick, Leicester, and St. Andrews. EBLM J0555-57Ab features a mass comparable to TRAPPIST-1—an ultracool dwarf surrounded by seven temperate Earth-sized worlds. But the radius of this tiny star is nearly 30 percent smaller. Small stars with masses less than 20 per cent of the Sun are likely common in the galaxy, yet we know very little about them because they’re so difficult to detect, owing to their small size and low brightness. But given how plentiful these stars are, and the vast number of exoplanets that likely orbit these objects, it’s imperative that we learn more about them. This new discovery is a step in that direction, and hopefully a sign of future discoveries.